Techniques used in mesotherapy treatment for hair loss are derived from mesotherapy. You will hear about proprietary approaches such as MesoHair, which have shown positive results with hair re-growth in both men and women. 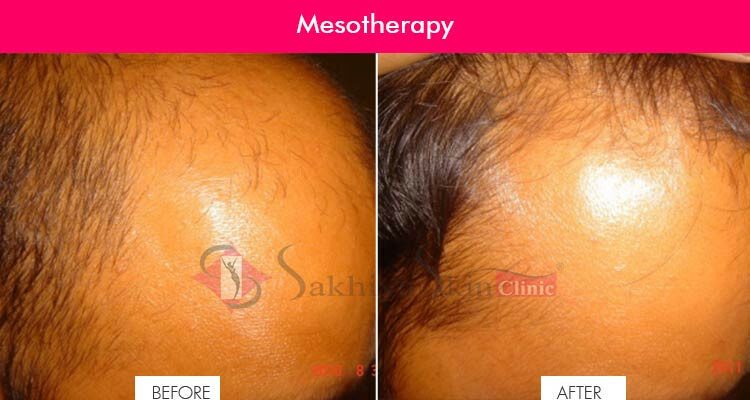 Find best Mesotherapy for Hair in Mumbai at Sakhiya Clinic. Using a specialized cocktail, your scalp is essentially given a vitamin boost which can improve the blood circulation in this area. Better circulation allows your hair follicles to be better nourished…all of which can improve hair regrowth. Over time, the mesotherapy solution will neutralize the DHT hormone, causing hair to grow again. Mesotherapy Treatment in Mumbai at Sakhiya Clinic is very reliable.